I guess you’ve already heard of the famous Luzhniki Stadium, the venue of FIFA world cup 2018. Luzhniki stadium is Europe’s eight largest stadium. Above all The stadium will host 7 matches including the opening game of the FIFA 2018 World Cup Russia on June 14. It will be the venue for the final on July 15. Certainly, it will be the best football venue in the world. Now we are going to tell you about the stadium. Luzhniki Stadium is the national stadium of Russia. It is located in its capital city, Moscow. Besides The stadium has recognization for cultural events and concerts. The stadium is in Khamovniki District of Moscow city, south-west of the city center. The location is close to the city of the center. Moreover, the location has very easy access to major transport systems throughout all over parts of the city. The location is on the bank of Moscow river. The architects select the area because of the nearest of the river, the green mass, clean and fresh air. It is one of the world’s best football stadiums. It is first built in 1956 while the first reconstruction took place at the 1980 Summer Olympic Games. Besides the stadium also hosted such events as 1973 Summer Universiade and 2013 World Championships in Athletics. Lastly, the next renovation of the stadium was for preparation for the 2018 FIFA World Cup. This time the renovation mainly focuses on the roof and seating areas and the engineers planned to increase up to the capacity to 81,000 seats From 78000. The architecture of Luzinski stadium based on three criteria. These are Architectural Value, Functionality, and Innovation. The stadium’s architecture meets modern and high technologies. It becomes convenient and comfortable space for the audience for enjoying football matches. The designers Dmitry Lamonov, Daniil Melkikh, Aleksandr Chernov, Ilya Makarenkov made an excellent blend of memory, history, and technologies to the stadium. They emphasized the theme and intent of the city. The main material of the stadium is glass. The shape of the stadium becomes like a dome with a central temporary natural grass pitch. It has 60 meters high weight bearing supports which consist of a metallic hi-tech basic structure. The architects made an artistic and creative exterior lighting of façade to focus the stadium’s impressive design in the evening. The stadium’s facade consists of an inverted and truncated cone with an open lattice structure. It creates monumental solidity. This facade is surrounded by new frieze design around the whole stadium displaying different kinds of motion of athletes. The frieze graphics exposed the architectural image of the stadium. The stadium defines inspiration by its dynamic shape and traditional depictions of Olympic games. The architects made the rhythm of the façade elements for ventilation and created dynamism. The stadium ensures all kinds of fire safety adequates. The Moscow government made The decision to preserve stadium’s exterior. So there is no change in the facade. The roof is the same as it was built. The only thing that has changed on the inside. It would be completely different in all the structure, architecture and geometry in the interior. The architects took a challenge to fit everything within the old façade. The famous old venue transformed into an ultra-modern stadium. The stadium will host the opening game in the final. This will be going to telecast a new stunning roof featuring media screen. It will project to everyone from outside the stadium. The bowl shape roof was over the stands with clear segments for passing through the light. It had gained a giant type screen throughout the circular truss, displaying footage both inside and outside of the truss to make visible for everyone. The entrance gate has been increased from 13 to 16. It has 44 cascade stairways. Space is designed to make sure all spectators are out of the stadium in less than 15 minutes after the game’s end. The spectator who will love to enjoy FIFA world cup 2018, will visit the Luzhniki stadium. The architecture of this stadium is comfortable for both the audience and the player. surely You will love this stadium. It is one of the most eye-catching stadiums in the world. You know, Russia as a country, built with full of extraordinary architecture design and development. This development of Russian architecture over the past thousand years also a part of the history of Western architecture. If you’re interested in Russian architecture I will highly recommend these two books that you must read. I can promise you that you will enjoy the utmost while reading the books. This is the first book to show the development of Russian architecture over he past thousand years as a part of the history of Western architecture. 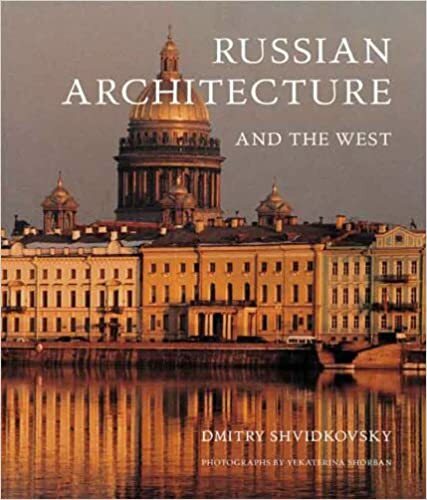 Dmitry Shvidkovsky, Russia’s leading architectural historian, and author of the book, offers compelling assessments of all the main masterpieces of Russian architecture and frames a radically new architectural history for Russia. Since its initial publication in 1993, A History of Russian Architecture has remained the most comprehensive study of the topic in English, a volume that defines the main components and sources for Russia’s architectural traditions in their historical context, from the early medieval period to the present. A History of Russian Architecture provides an invaluable cultural history that will be of interest to scholars and general audiences alike.